Swāt (Pashto/Urdu: سوات [ˈswaːt̪]) is a river valley and an administrative district in the Khyber Pakhtunkhwa Province of Pakistan. It is the upper valley of the Swat River, which rises in the Hindu Kush range. The capital of Swat is Saidu Sharif, but the main city in Swat is Mingora. It was a princely state, the Yusafzai State of Swat, until 1969, when it was dissolved along with the states of Dir and Chitral and made part of Khyber Pakhtunkhwa. With a population of 2,309,570 according to the 2017 census, Swat is the third-largest district of Khyber Pakhtunkhwa. The name Swat is derived from Suvastu which stood for river Swat in the ancient times. 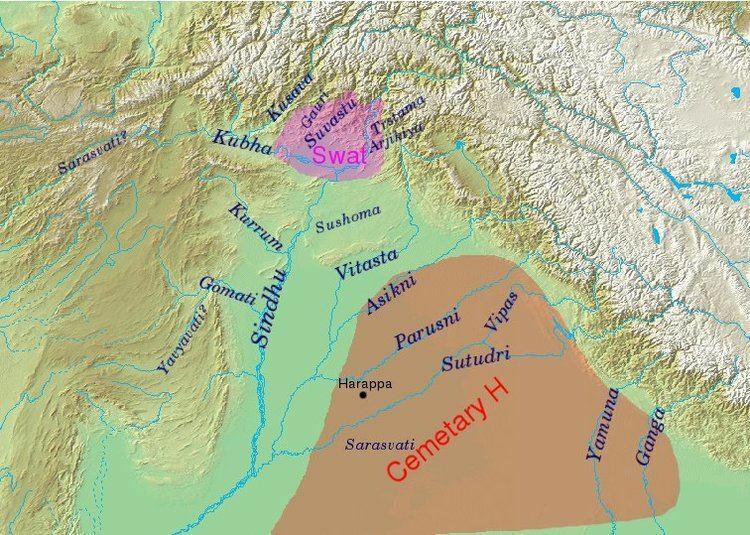 The river Suvastu is mentioned in the Rigveda. This is probably the precursor to the river Swat. Swat has been inhabited for over two thousand years. The first inhabitants were settled in well-planned towns. In 327 BC, Alexander the Great fought his way to Odigram and Barikot and stormed their battlements. In Greek accounts these towns have been identified as Ora and Bazira. Around the 2nd century BC, the area was occupied by Buddhists, who were attracted by the peace and serenity of the land. There are many remains that testify to their skills as sculptors and architects. Later some Dilazak entered the area along with Sultans from Kunar and their tribe was styled as Swatis. The originator of the present family of Swat was the Muslim saint Akhund Abdul Gaffur, more commonly known as Saidu Baba. He was a pious man and the people respected him so greatly that they called him Akhund Sahib. During the mid-19th century, Muslim tribes were fighting against each other for the possession of Swat Valley. On the intervention of the honourable Saidu Baba, the killing was stopped, and such was his influence that the chiefs of all tribes unanimously made him the ruler of the valley. Saidu Baba administrated the valley according to Muslim laws. Peace and tranquility prevailed, and agriculture and trade flourished in the territory. Saidu Baba had two sons by his wife, who belonged to Naik pi Khel (نیک پی خیل). After the death of Saidu Baba, the tribal chiefs again started fighting and killing, which continued for years. Eventually the tribal chiefs agreed to give the control of the valley into the hands of the honourable Gul Shahzada Abdul Wadood, the son of Mian Gul Abdul Khaliq, son of Saidu Baba. The wife of Mian Abdul Wadood was the daughter of Afzal-ul-Mulk, the ruler of Chitral. The British by trick put Chitral under the suzerainty of Kashmir. The Chitral ruler gave two horses every year to the Rajia of Kashmir, and the Raja provided Chitral with grain and sugar, etc. Swat thus went under protection of the British. During the rule of Mian Gul Muhammad, Abdul Haq Jehanzeb, the son of Mian Abdul Wadood Sahib, the state acceded to Pakistan in 1947. The Princely State of Swat (Urdu: ریاست سوات‎) was a province of the Durrani Empire ruled by local rulers known as the Akhunds, then until 1947 a princely state of the British Indian Empire, which was dissolved in 1947, when the Akhwand acceded to Pakistan. The state lay to the north of the modern Khyber-Pakhtunkhwa Province of Pakistan and continued within its 1947 borders until 1969, when it was dissolved. The present prince, Muhammad Aurzngzeb Khan, son of Jahanzeb, married the daughter of Field Marshal Mohammad Ayub Khan in 1955. Thus by intermarriages with the other castes, the family became a branch of the imperials i.e., the Royal family of Swat valley which laid down the foundation of Swat kingdom. Jahanzeb started a degree college at Saidu Sahrif, the capital of the state, and four high schools at Mingora, Chakesar, Matta and Dagar. Fourteen middle schools, twenty-eight lower middle schools, and fifty-six primary schools were established. A girls high school and high class religious schools were established at Saidu Sharif. At all the schools, the poor students were granted scholarships. The state was an exemplary state during British rule. They also have a firm stand in politics of Pakistan. A member of the family Prince Miangul Aurangzeb was also Governor of Baluchistan. Historically known as Uddiyana, Tantric Buddhism flourished under King Indrabhuti, however, there is an old and well-known scholarly dispute as to whether Uddiyana was in the Swat valley, Orissa or some other place. Padmasambhava (flourished eighth century AD), also called Guru Rimpoche, Tibetan Slob-dpon (teacher), or Padma 'byung-gnas (lotus born), semi-legendary Indian Buddhist mystic who introduced Tantric Buddhism to Tibet was, according to tradition, native from Uddiyana. He is revered as the second Buddha in Tibet. Padmasambhava is said to be the son of Indrabhuti, king of Swat in the early eighth century AD and one of the original Siddhas. Indrabhuti's sister, Lakshminkaradevi, is also said being an accomplished siddha of the 9th century AD. The Swat museum has acquired footprints of the Buddha, which were originally placed for devotion in the sacred Swat valley. When the Buddha ascended, relics (personal items, body parts, ashes etc.) were distributed to seven kings, who built stupas over them for veneration. The Harmarajika stupa (Taxila) and Butkarha (Swat) stupa at Jamal Garha were among the earliest Gandhara stupas. These were erected on the orders of King Ashoka and contained the genuine relics of the historic Buddha. The Gandhara school is credited with the first representations of the Buddha in human form, rather symbolically as the wheel of the law, the tree, etc. As Buddhist art developed and spread outside Gandhara, Gandharan styles were imitated. In China the Gandhara style was imitated in bronze images, with gradual changes in the features of these images over the passage of time. Swat is celebrated throughout the Buddhist world as the holy land of Buddhist learning and piety. Swat was a popular destination for Buddhist pilgrims. Buddhist tradition holds that Buddha himself came to Swat during his incarnation as Gautama Buddha and preached to the people here. It is said that the Swat valley was filled with fourteen hundred imposing stupas and monasteries, which housed as many as 6,000 images of the Buddhist pantheon for worship and education. Archaeologists now know of more than 400 Buddhist sites covering an area of 160 km2 in Swat valley alone. Among the excavations of Buddhist sites in Swat an important one is Butkarha-I, containing original relics of the Buddha. A stone carved statues of Buddha, are still existent in the village Ghalegay and Jehanabad Manglawar. There is also a big stupa in Shingardar Ghalegay and other ones are located in Amlukdara near Barikot and Shnasha stupa near Batora village. Swat was ruled by the Hindu Shahi dynasty, who built an extensive array of temples and other architectural buildings, now in ruins. Sanskrit may have been the lingua franca of the locals. Hindu Shahi rulers built fortresses to guard and tax the commerce through this area. Their ruins can be seen in the hills of Swat: at Malakand pass at Swat's southern entrance. At the end of the Mauryan period (324–185 BC) Buddhism spread in the whole Swat valley, which became a very famous center of Buddhist religion. After a Buddhist phase the Hindu religion reasserted itself, so that at the time of the Muslim conquest (1000 AD) the population was solidly Hindu. In 1023, Mahmud of Ghazni attacked Swat and crushed the last Buddhist King, Raja Gira in battle. The invasion of Mahmud of Ghazni is of special importance because of the introduction of Islam as well as changing the Chronology. The first Muslim arrivals in Swat were Pakhtun Dilazak tribes from south-east Afghanistan. These were later ousted by Swati Pakhtuns, who were succeeded in the sixteenth century by Yusufzai Pakhtuns. Both groups of Pakhtuns came from the Kandahar and Kabul valley. Swat Valley, located in the Khyber Pakhtunkhwa Province, has many Buddhist carvings, statues, and stupas. The town of Jehanabad contains a Seated Buddha statue. Kushan era Buddhist stupas and statues in Swat valley were demolished by the Taliban, and after two attempts by the Taliban, the Jehanabad Buddha's face was dynamited. Only the Bamiyan Buddhas in Afghanistan, which the Taliban also demolished, were larger than the Buddha statue in Swat. The government did nothing to safeguard the statue after the initial attempt at destroying the Buddha, which did not cause permanent harm; when the second attack took place on the statue, the feet, shoulders, and face were demolished. Islamists (particularly the Taliban) and looters destroyed many of Pakistan's Buddhist artifacts, which dated to the Buddhist Gandhara civilization. The Taliban deliberately targeted Gandhara Buddhist relics for destruction. Gandhara artifacts were thereafter plundered by thieves and smugglers. In 2009, the Archbishop of the Roman Catholic Diocsece of Lahore, Lawrence John Saldanha, wrote a letter to Pakistan's government denouncing the Taliban activities in Swat Valley, including their destruction of Buddha statues, and their attacks on Christians, Sikhs, and Hindus. A group of Italians helped repair the Buddha. The valley of Swat is situated in the north of Khyber Pakhtunkhwa, 35° North Latitude and 72° and 30° East Longitude, and is enclosed by the sky-high mountains. As mentioned above, Swat lies in the lap of mountainous ranges, which are the offshoots of Hindukush, so the larger part of Swat is covered with high mountains and hills, the crests of which are hidden by everlasting snow. Though these gigantic ranges run irregularly: some to the west while the others to the east, but the general direction is North-South. These ranges enclose small but very enchanting valleys. In Kohistan-e-Swat the chief knot of eastern ranges is Mankial. Its northern branches separate Kohistan-e-Swat from Abasin Kohistan. These ranges form a barrier between Gilgit and Swat, and between Chitral and Swat. The southern extension of Mankial ranges reaches proper Swat. There they join Shangla ranges. Shangla ranges separate proper Swat from Shangla Par area (Shangla Par district). In Shangla district, there are Karora Ranges, which separate Puran from Kanra and Ghurband. The continuation of Shangla ranges joins Dwasaray. On the one hand Dwasaray separates lower Swat from Puran, on the other, it set aside the Buner from Puran. Now the general direction of the ranges turns westward. Here it is called Elum. Elum Ranges is a big wall between the proper Swat and Buner. The Elum ranges at last join mountains of Malakand. Western ranges start from the mountain and hills of Gabral, Kohistan-e-Swat. It joins the hills of Kundal (Utror). There these ranges meet Daral Ranges. These ranges form a border with Dir district. They run westward and are named according to the locality. For example, Lalko ranges Manrai and Chaprai etc. at last they join the hills of Adenzee and Shamozee. Manrai ranges send off some offshoots southward. The hills separate Arnoyay valley from the widest valley of Nekpikheil valley. Actually the valley of Swat starts from the foothill of Malakand but we are concerned with portion from Landakay to Gabral (Gulabad), the area within the administrative boundaries of Swat. The length of the valley from Landakay to Gabral is 91 miles. Two narrow strips of plains run along the banks of Swat River from Landakay to Madyan. Beyond Madyan in Kohistan-e-Swat, the plan is too little to be mentioned. So for as the width concerns, it is not similar, it varies from place to place. We can say that the average width is 5 miles. The widest portion of the valley is between Barikot and khwaza khela. The widest view point and the charming sight where a major portion of the valley is seen is at Gulibagh on main road, which leads to Madyan. There are some subsidiary valleys, which help to increase the width of the main valley. These subsidiary valleys are called "Daras". A Dara a narrow passage between mountains, and sometimes, the upper course of a river is also called Dara. If we imagine the main valley as a stem of a tree the subsidiary valleys form its branches. Swat River and its tributaries drain Swat. Therefore, the whole valley is the outcome of running water. This flowing water cuts the upper courses deeply, and flows the load of washed away materials. As the gradient is greater in the upper course so the erosion is on large scale, particularly in the summer rains, when all the rivers are in flood. The big boulders and stones are rolled, which causes more destruction in the upper courses. When the loaded water reaches to the areas of low gradient, the heavier materials are deposited. The deposition takes place according to the slope, generally, we observe, that the upper course is made up of big boulders, the middle course is of relatively small stones, pebbles, and debris, while the lower course is made of fine clay. Anyhow, the whole plain of Swat valley is strewn by the running water, and is made up of fine alluvial soil. Approximately 38% of economy of Swat depends on Tourism and 31% depends on Agriculture. Gwalerai village located near Mingora is one of those few villages which produces 18 varieties of apples due to its temperate climate in summer. The apple produced here is consumed in Pakistan as well as exported to other countries. It is known as ‘the apple of Swat’. Swat is famous for peach production mostly grown in the valley bottom plains and accounts for about 80% of peach production of thecountry. Mostly marketed in the national markets with brand name of "Swat Peaches". The supply starts from April and continue till September because of a diverse range of varieties grown. 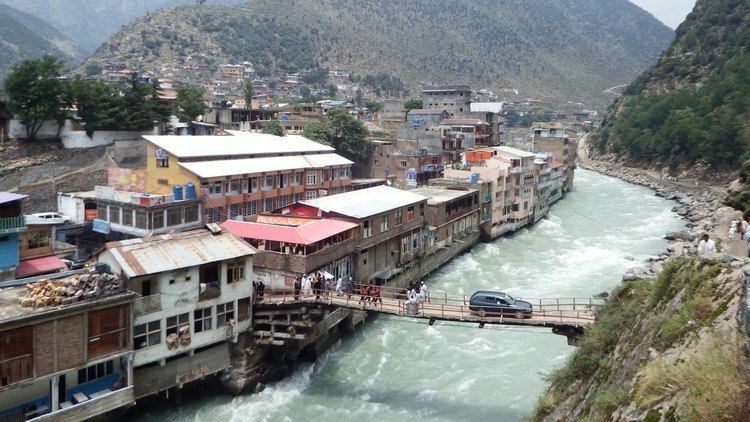 The population of Swat District is 2,309,570 as per the 2017 census, making it the third-largest district of Khyber Pakhtunkhwa after Peshawar District and Mardan District. According to 1981 census, Pashto is main language and spoken by 90.28% of population while Kohistani is spoken by 8.67%. Kalami, Torwali and Urdu are also spoken by a fraction of population. Alongside the Gurjar Bakarwal people. Each Tehsil comprises certain numbers of Union councils. There are 65 Union councils in District Swat: 56 rural and 9 urban. According to Khyber Pakhtunkhwa Local Government Act 2013. There were new system introduced called as Local Governments which have District Swat has 67 Wards, of which total amount of Village Councils is 170, and Neighbourhood Councils is 44. The region has gone through considerable changes over the last few years since the dissolution of the princely state in 1969. Members of the former Royal family have since on occasion been elected to represent the area in the Provincial Assembly and National Assembly. The region elects three male members of the National Assembly of Pakistan (MNAs), one female MNA, seven male members of the Provincial Assembly of Khyber Pakhtunkhwa (MPAs) and two female MPAs. In the 2002 National and Provincial elections, the Muttahida Majlis-e-Amal, an alliance of religious political parties, won all the seats amidst a wave of anti-Americanism that spread after the United States' invasion of Afghanistan. In General Election (GE) 2008, Awaami National Party (ANP) claimed to bring peace and all the National and Provincial assembly seats in Swat. ANP tried their best but was unable to cope with the situation as the law and order situation was worse. It was one of the major reasons that in GE 2013 the people of swat denied ANP and voted for Pakistan Tehreek-e-Insaf. Marghazar 16 km away from Saidu Sharif is famous for its Sufed Mahal the white marble palace built by the first Wali (ruler) of Swat. It used to be the ruler's summer residence. Queen of England was hosted there once as well. The marble used to build White Palace was the same marble which was used to build Taj Mahal. It was turned into a hotel. Fizagat Park is a recreation arena for the tourists and the locals situated at 1 kilometer from Mingora city. Situated along the bank of the River Swat, tourists enjoy bath and pleasant climate in summer. Malam Jabba (also Maalam Jabba, Urdu: مالم جبہ) is a Hill Station in the lower Swat mountain ranges nearly 42 km from Saidu Sharif in Swat Valley, Khyber Pakhtunkhwa, Pakistan. It is 314 km from Islamabad and 51 km from Saidu Sharif Airport. Malam Jabba is home to the largest ski resort in Pakistan. On the main Madyan-Kalam road, the road turns to the right at Manglor town (12 km from Saidu Sahrif), for the Malam-Jabba Dara which has a series of small villages and settlements like Salanda, Jehanabad, Talegraam, Badar, Ser, Malam, Kishora, Spine Oba, and finally Jabba. Malam is small village comes prior to Kishora village on the main Malam-Jabba road. Malam is nearly 17 km from Manglor while Kishora is at 18 km distance. Jabba (12 km from Kishora) is the upper most part of the whole Dara (gorge). The Malam Jabba Ski Resort, owned by the Pakistani Tourism Development Corporation, had a ski slope of about 800m with the highest point of the slope 2804 m (9200 ft) above sea level. Malam Jabba Ski Resort was the joint effort of the Pakistan government with its Austrian counterpart. The resort was equipped with modern facilities including roller/ice-skating rinks, chair lifts, skiing platforms, telephones and snow clearing equipment. Unfortunately the resort was destroyed by the Taliban when they were in hold in swat valley. Now that writ of the government has been reinstated and peace established, tourism has picked up. The government of Khyber-Pakhtunkhwa(KPK) has awarded the tender for rebuilding the Malam Jabba skiing resort to a private company. Work is going on in full swing and is slated for a 2017 completion date. Skiing has already been restored and a skiing festival was held in Jan 2015. 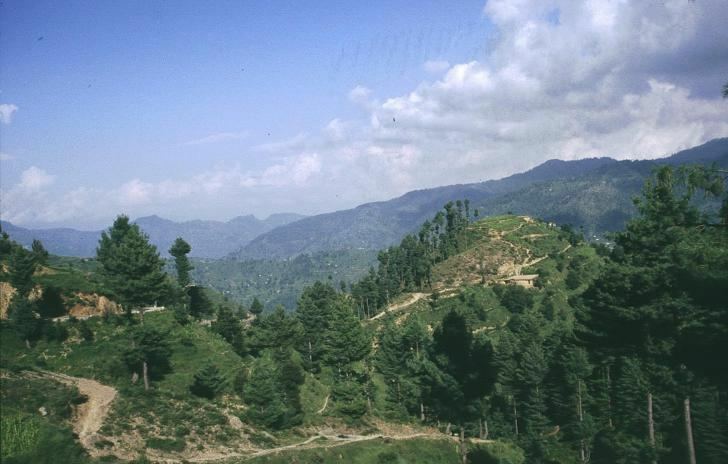 Malam Jabba, as its name suggests, has many green pastures and meadows surrounded mostly by pine trees. One of the major mountains of Malam Jabba is Sagarrh Sar (ساگڑ سر)at 9,400 feet approximately above sea level and is very prominent in the whole Dara (gorge)of Malam-Jabba. Tourist from other parts of Pakistan and around the world come to Malam-Jabba in both the summer and winter seasons. Swat Museum is on the east side of the khile Gando street, halfway between Mingora With khile Gando and zaina gandu. Japanese aid has given a facelift to its seven galleries which now contain an excellent collection of Gandhara sculptures taken from some of the Buddhist sites in Swat, rearranged and labelled to illustrate the Buddha's life story. Terracotta figurines and utensils, beads, precious stones, coins, weapons and various metal objects illustrate daily life in Gandhara. The ethnographic section displays the finest examples of local embroidery, carved wood and tribal jewellery. For the last three years the museum is occupied by Pakistan army and it is not known when they would be leaving it. Miandam is a small summer resort ten kilometres (six miles) up a steep side valley and 56 kilometers (35 mi) from Saidu Sharif, making it an hour's drive. The metalled road passes small villages stacked up the hillside, the roofs of one row of houses forming the street for the row of houses above. Tiny terraced fields march up the hillside right to the top. Miandam is a good place for walkers. Paths follow the stream, past houses with beehives set into the walls and good-luck charms whitewashed around the doors. In the graveyards are carved wooden grave posts with floral designs, like those used by Buddhists 1,000 years ago. By the time you reach this small town at 1320 m and about 60 km from Mingora, the mountains have closed in and the valley is almost snug. Here one senses why Swat is so popular among the tourists. There are a lot of embroidered shawls in the Bazars of Madyan. At 1,321 metres (4,335 feet) above sea level, but it is a larger town and has many hotels in all price ranges and some good tourist shopping. Antique and modern shawls, traditional embroidery, tribal jewellery, carved wood and antique or reproduced coins are sold along the main street. This is the last Swati village, offering interesting two-and three-day walks up to the mountain villages... ask in the bazaar in Muambar Khan's shop for a guide. North of Madyan is Swat Kohistan where walking is not recommended without an armed guard. The central mosque at Madyan has carved wooden pillars with elegant scroll capitals, and its mud-plastered west wall is covered with relief designs in floral motifs. Both bespeak the Swati's love of decoration. 2070 m high and 100 km from Mingora, it was the centre of an independent state in the 19th century. It was later taken by Chitral then given to Swat after partition. Kalam, 29 kilometres (18 mi) from Bahrain and about 2,000 metres (6,800 feet) above sea level, the valley opens out, providing rooms for a small but fertile plateau above the river. In Kalam the Ushu and Utrot rivers join to form the Swat river. Here, the metalled road ends and shingle road leads to the Ushu and Utrot valleys. From Matiltan one gets a breath-taking view of the snow-capped Mount Falaksir 5918 metres (19,415 ft.), and another unnamed peak 6096 metres (20,000 ft.) high. Usho (also spelled Ushu) is a hill station in the north east of Kalam valley. It is situated at a distance of 8 kilometers (5.0 mi) from Kalam and 123 kilometers (76 mi) km from Saidu Sharif at the height of 2,300 metres (7,550 feet). It is accessible through a non metalled road from Kalam by jeeps only. Utror 16 km from Kalam Valley and 120 km from Saidu Sharif. Utror valley is situated between 35° 20′ to 35° 48′ N latitudes and 72° 12′ and 72° 32′ E longitudes. The population of Utror is 6888 and the area of the valley is about 47400 hectares. Utror valley is surrounded by Gabral and Bhan valleys on the east, upper Dir district on the west, Kalam valley on the south and Gabral valley on the north. It is 15 km from Kalam, the centre of Swat Kohistan. The altitude of the valley at Utror proper is 2300 meters and reaches to 2900 meters at Kandol Lake. Gabral valley lies between 35° 20′ to 35° 48′ N latitudes and 72° 12′ and 72° 32′ E longitudes over an area of about 38733 hectares. The population of Gabral is 3238. 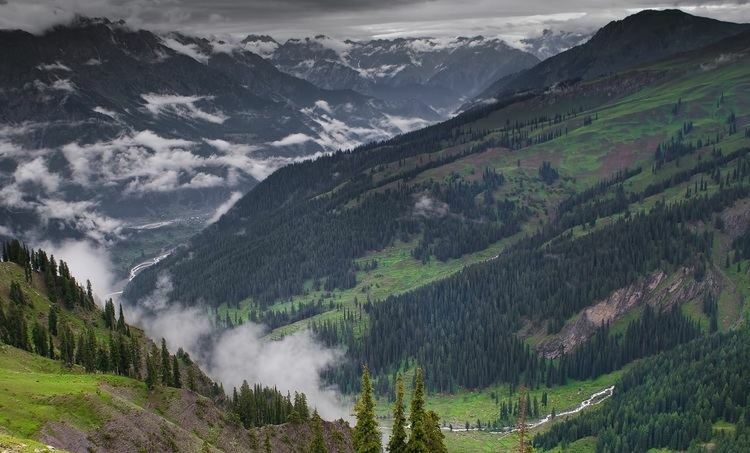 The valley is surrounded by Chitral District in the north, Utror valley in the south and south west, upper Dir district in the west and Bhan and Mahodand valleys in the east. It is 5 km distant from Utror proper and 20 km from Kalam. The altitude of the valley ranges from 2580 metres at Baila to 5160 metres at Karkaray Lake top. In Utror and Gabral, 44 medicinal plants are collected during the months of May, June, July and August. Only 14 of them are traded to National and International markets while the rest are used locally. A survey by Pakistan Forest Institute concludes that 75 crude herbal drugs are extensively exported and more than 200 are locally traded in Pakistan. Indigenous people, who have no training in sustainable harvesting, post-harvesting care and storing of medicinal plants, collect 85 percent of these crude herbs from the wild. Mahodand valley, in the North of Kalam, is famous not only among nature lovers and escapists but also the exotic trout fish hunters. The valley can be accessed through an un-metalled road from Kalam in a four by four (4x4) vehicle. The road is bumpy and tricky but the surrounding landscapes engrosses you so severely that you wish for more and expect to discover new panoramas. The small hamlets that are scattered in the mountains and the bellowing smoke that spirals into the sky from the houses are some, which lives in the memory forever. Swat River, which is born here, is shackled by the tall mountains, which has turned its water into a roaring monster trying to release itself from its fetters, but there are some places where the river is calm and silent without showing any sign of rebellion. Pari Lake is one of the lakes in Swat region which is located at a very high altitude in the foot of the tallest peak in the range with a considerable depth. The name Pari or Khapiro is given to the lake due to the widespread belief that the lake is the abode of fairies where they live and bathe in the cool, pure and clear water of the lake. It is located to North-east of Utror valley and can be accessed only by trekking. Trekking to the lake needs endurance and love for nature as the trail is exasperating as well as dangerous therefore, utmost care should be taken while trekking on the narrow bends and turns leading to the lake. The lake is accessible from both Izmis and Kundal lakes. Two ascending tracks lead to this lake from Kundal and Izmis lakes taking almost five hours to reach this roof top of Swat. The trail is very steep from both sides. The pastoral valley of Swat has abundance of precious resorts of nature where one can find solace and respite from the never-ending struggle of life. Kundal or Kandolo Lake is one such place here upon which the Maestro of nature has spent extra time and effort to paint. Kundal Lake is situated in the north of Utror valley. One can easily access it from Kalam via Utror from where a link road ends in a green valley called Ladu in the foothills of the lake. You can either hike to Ladu from Utror or take a four-wheeler to ease and minimize your journey. It takes almost two hours to reach the valley of Ladu. For the adventurous kind, a walk in the romantic valley will unravel several new mysteries. The people who take temporary residency over here during summer plow the open land and harvest potatoes and turnips, which are famous all over the country for its exotic taste. There is also a small hut in Ladu where you can take tea and get something for eating. From Ladu it takes almost four hours to reach the lake. Some locals can guide you and even take your luggage if properly paid. The mountains around this small valley are covered with tall cedar and pine trees and meandered by different streams and torrents. The people are friendly and provide you guidance if needed. Bashigram Lake is situated to the South of Bashigram valley near Madyan (56 km from Saidu Sharif). Bashigram Dara (gorge) a gorge of the Chail Dara (A sub-valley and in the East of Madyan). From Madyan a jeeb able road goes alond the Chail Dara covering villages like Shinko and reaches Bashigram village. Trek to Bashigram Danda (lake) starts from Kas banda ( "Banda" is a local term for small human settlements) and ascending through Kafir Banda, Deenai Banda and finally Dand Banda. Lake is just after Danda Banda. Total trekking distance is around 9 km and takes seven (7) hours to reach to. The trek to the lake offers some breathtaking views of Bashigram Dara and its majestic human settlements. The Lake of Bashigram is covered by a towering peaks. Mount Pyazai Sar ridge rises above the lake on its North-West side. The green water of Bashigram Danda looks very enchanting. The glaciers floats on the surface of it almost all the year. The giant glacier - which for whole part of the year does not melt completely - is at the south end of the lake, has become very famous and known among the tourists who have visited the lake. The stream that comes out of this lake is called Bashigram Khwarr (stream) which is a clear and greenish water source for the Chail Khwarr. The shepherds from time to time moves along these settlements with their herds for grazing purposes. The lake can also be trekked from Maindam and Alpurai valleys of Swat and Shangla districts respectively. Spin Khwar is a lake in the lap of mountains towards the north of Kundal Lake and east of Utror valley. The name Spin Khwar has a clear significance as a small white stream in the east flows down to the lake from the surrounding mountains and is a major source of water for the lake. The lake is accessible through two tracks, one from Kundal and the other from Ladu valley. The track from Ladu is comparatively easy to walk and less tiring while the track from Kundal is not only difficult but alarmingly dangerous although it is short and links Kundal and Spin Khwar. Its steepness and dangerous bends need an experienced trekker and unending physical strength. The grazers in the area have built small huts and a mosque where one can stay but a personal tent is more recommended as these huts are in a poor condition due to lack of maintenance. Daral lake is situated to the northeast of Sidgai Lake and can be accessed through Saidgai after two three hours of rigorous trekking. A close look towards the south reveals the long and winding sellouts of the River Swat in the horizon. After walking and trekking for about two and a half hours on bare and naked mountains, the trail starts descending towards the East where Daral Lake is located. Wild Life: In early days when the shrubs and bushes covered slopes and foothill areas, hares, porcupine, fox, jackal, wolf, pigs, and hyenas were in large number. Now the need for fuels decreased the scrubs and trees, so these animals have decreased considerably. In the forests, monkeys are often found. Among the birds: hawks, eagles, falcons are found in the high mountains, while pheasants, partridges, hoopoes, larks, sparrows, quails, doves, swallows, starlings, nightingales, crows, kites, vultures, owls, bates are the common birds. Bees: The bees were kept in Swat commonly, and the pure honey of was famous all over the country. But now the moveable beehives have affected the Swat locally reared bees greatly. Now, the local good honey is found in remote areas only, while the honey of moveable hives is available everywhere in low prices. Fisheries: There is a large fishery in Madyan. In this fishery the trout fish are being reared. In Kohistan-e-Swat there are some private fisheries too. In Buner the fish were being reared in Barandu, Dagar. Moreover, the Swat River serves as a permanent fishery throughout the year while the tributaries of it are used for fishing only in spring season. Mineral Resources: Mines' production plays an important role in the economy of a country, particularly in the regions where they exist, because, the local people get the opportunities to labor in, and earn their livelihood. But the Swati mines have no importance for the local people in this respect. It is necessary, however, to mention what they are, and where do they exist. Swat is rich in mineral wealth, but the discovered commodities are a few. Among them, the china clay stands first; others are marble stone, and emerald. China Clay: The china clay exists at "Kathyar" in Nekpikheil (on the road that leads to Shahderai at a distance of 15 miles from Mingora). This is the largest mine, having the finest quality, of China clay in Pakistan. The clay is mined here, and is transported to Shaidu in Nawshehra (which is at a distance of around 100 miles from Swat). It is not so advantageous for the local people, because they have no opportunity to work in the complex. Soap Clay: The mine of soap clay has been discovered recently between Alpurai and Kanra on the side of Gilgit Road (Shahrah-e-Resham). It is spread in a vast area. Marbles: The marbles are dug near Charbagh, Murghuzar, and Barikot in the proper valley of Swat, and in Buner, it is mined in Thor Warsak, Bampokha, and Sawawai. Moreover, there is a great expectation of iron ores, which will be discovered in near future. Emerald: The finest quality of emerald is produced in Swat. Its Color and transparency is unique. It is the best in world. It is exported to the international markets: There is an export potential of 500 million dollars in this sector, provided it is excavated and cut as per international standards. Before the absorption of Swat in Pakistan, the emeralds of Swat were better in quality, and greater in quantity. But since then it is said that the quantity of production is little, and the quality devalued. 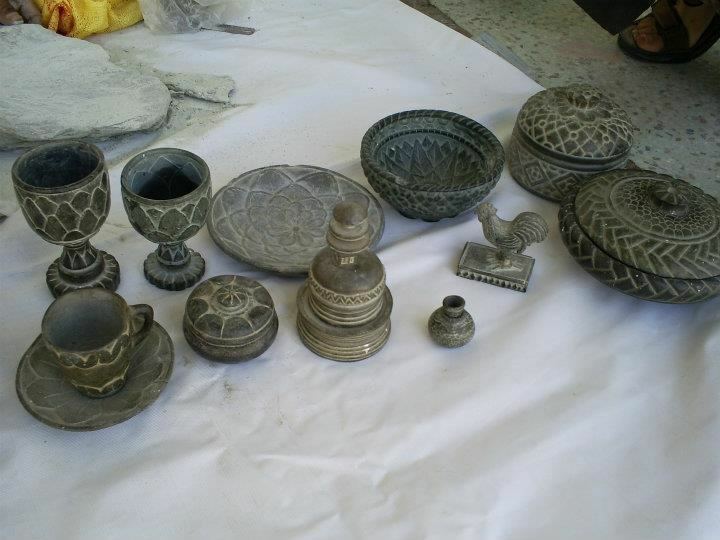 Handicrafts: The handicrafts of Swat are very famous. When a tourist visits Swat, he accumulates bundles of these articles as gifts for his friends. All of the crafts prepared here are interesting, especially, the following are very charming. Woolen Blankets: These blankets are known as "Sharai". They are prepared of wool obtained from the local sheep. The weight of a medium size blanket is four kilos. This is the best source of defense from the severity of winter. It is woven in Dewlai, Kala Kalay, Salampur, Puran, and Ghurband. These villages prepare the items on commercial scale. Shawl: Shawl is a younger brother of Sharai, as it is also a woolen sheet, but light in weight. Sometimes, cotton is also mixed in its texture. It is fringed, and is commonly used by ladies. Shawls are prepared in Salampur and Dewlai "Jolabad" on commercial bases. Rugs: The next important thing, made of local fleece with laborious work, is rug. This is prepared in the villages by pressing wool with the help of water spray. After preparation, it is beautified with the usage of various colors. Rugs are the traditional carpets of shepherds, but now are used everywhere. Panrae or Panhey: Panrey or Panrhey is the old fashion of shoes, still used by the old persons in Swat. They are made in Swat with the simply tanned leather. The cobblers have great skill in the formation of ladies shoes with golden lace work. Similarly, the sandals with golden lace work are also made. The cobblers of Shahderai had great skill in this field. It is now archaic. Shkor: A Shkor is a pot in which chapatis (plate bread used in India and Pakistan) are kept. The ordinary Shkors are prepared everywhere in Swat, but a special design is made in Puran and Chagharzee (These Shkors are high-based pots made of wheat stalks with laborious art, not easily available in bazaar). Furniture: Furniture of various styles is made in the district. The cots, tables, chairs, dressing tables, cradles of more advanced types, etc. are furnished in Mingora, and in nearly all large villages.